Spice has just launched a new type of mobile phone at an affordable price it can project images on the screen. 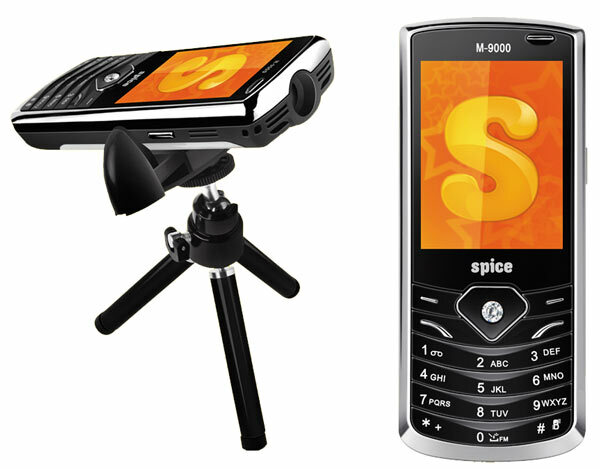 The Spice Popkorn Projector M9000 mobile comes with an inbuilt projector, allowing you to project the phone s contents on a large screen. 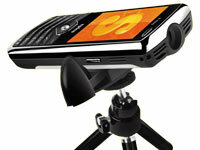 You can therefore project presentations, movies, pictures or even live TV, thanks to the analog TV chip inside the phone, which can receive free terrestrially broadcast TV channels. The M9000 has a Document Viewer, which lets you view various office document formats such as Word, Excel, PowerPoint, and even PDF on the handset. The mobile also sports a laser pointer, which is very useful while making presentations, though we think that the projector and laser pointer cannot be used at the same time. Basic phone features include a 6 cm (2.36 inch) 262K color QVGA screen, dual GSM SIM, quad band capability, WAP, GPRS, EDGE, JAVA, 3.2 MP camera, support to play various video formats including 3GP, mp4, AVI, FLv, RM and RMVB, MP3 player with FM radio and stereo Bluetooth and support for up to 16 GB T-flash memory card. With dimensions of 119.2 mm x 50.3 mm x 17.35 mm, this candy bar phone weighs just 123 g.
The Spice Popkorn M9000 is priced aggressively at just Rs.6,999.